The Emergency Management Officer must have a pretty good sense of humor, though, because he decorated the paper with little graphics of a cloudburst (reminiscent of last year's flood? ), an erupting volcano, and a shaking house. He also referred to the Emergency Preparedness Tri-fold Brochure as "the boring white one" and the "Volcanic Ashfall Tri-fold" as "also boringly white" and "extra guidance as we live next to one . . . " No kidding, I live ON it! Other cool things in the bag were two refrigerator magnets with numbers and information, a wallet card with the same, and, coolest of all, a whistle/light key chain with US NAVY EM printed on it. There's even a little compass on it! The EMO again shows his sense of humor with "a toy perhaps, but the light works and it's a lot easier to blow a whistle to attract attention than to yell for a long period of time." Good point. The last item in the bag is a map of the area with primary and alternate routes. Unfortunately, the map ends well before it ever gets near my town, but it's possibly useful for newcomers and visitors. Actually, there is a lot of good, useful information in the kit, and I love the whistle/light! I just hope I never have to shovel ash off my roof or let the ash settle in my water before drinking it. That did happen in 2002, though, two years before I moved here. These are Kendra's photos to prove it! 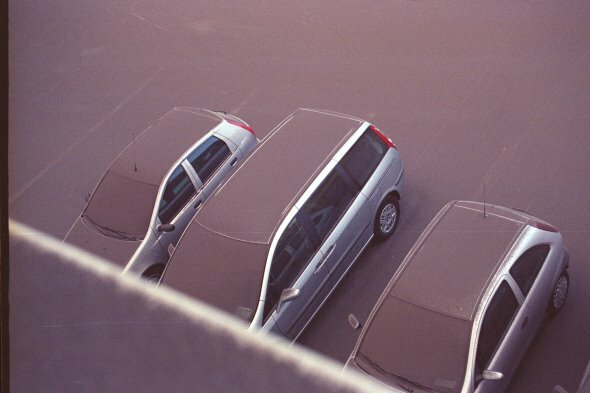 Check out the ash on these cars and the guy shoveling it! This weekend was the 42nd running of the Catania-Etna hill-climb race here in Nicolosi. 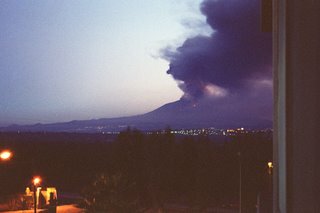 Why "Catania" is in the title, I have no idea, because it actually starts here in Nicolosi and goes up the volcano for 9.2 kilometers. I don't know all the details of it, but I'll tell you what I know. 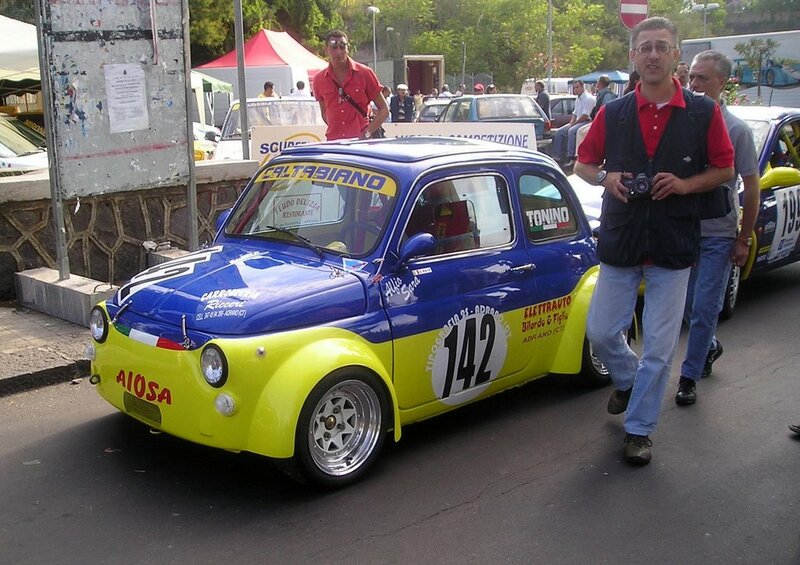 There are several classes of competition, ranging from "Teeny-Weeny" to "Major Big Professional" race cars. It's a timed race rather than a head-to-head competition. 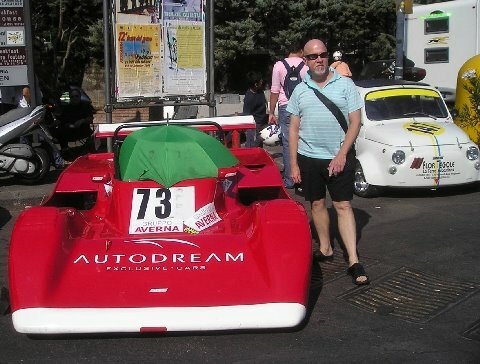 In other words, only one car at a time races up the hill and the fastest time wins. 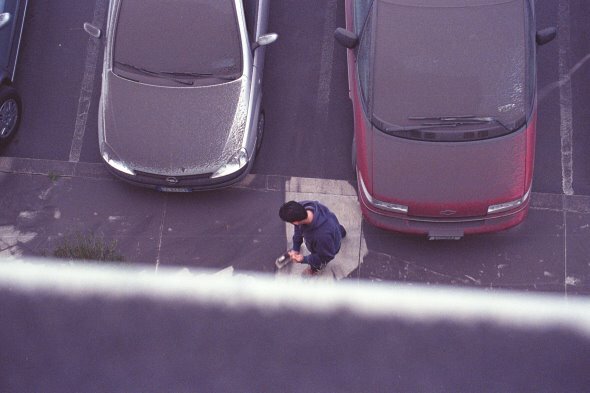 They space the cars out a minute apart, which is supposed to be enough time so they don't run over each other. Speaking of running over, Sicilian spectators could not seem to stay off the course, despite the best efforts of many policemen and race officials. They kept dashing across the road, sometimes carrying babies, sometimes a sausage sandwich, and they kept getting yelled at for it. One was even pushed up and over the wall alongside the road by a security guard. Nonetheless, they kept doing it and I didn't see anyone actually get killed. 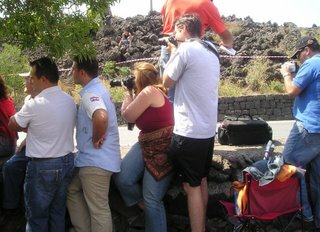 It was a very festive atmosphere on the course up on Etna, with many food vendors (including horsemeat burgers), live cameras, and spectators all over the rough lava rocks alongside the roadway. It was probably the only time I've actually seen Sicilian women wear sensible shoes instead of five-inch spiked heels. We managed to snag a pretty good spot and watched, ate, and took pictures for a few hours before crawling over the lava to hike back to our car. It was being "watched" by the inevitable Sicilian "parking guy" who charged a mere two euros for parking on a public road in a national park. The second funniest (aka "stupidest") thing we observed was the long line of cars backing up, in reverse, for kilometers because they somehow thought they could bypass all the zillions of parked cars and zoom right up to the spectator area and find a parking place. Hahahaha! Surprise! We observed this phenomena both on our way in and our way out. It was quite comical and worth the two euros for parking. Added to my granite knowledge base today: this is granite served "in brioche!" They actually cut open the sweet bun and put the granite right in it, add a little plastic spoon, and there you go! This makes cones (as in ice cream cones) totally pale in comparison! 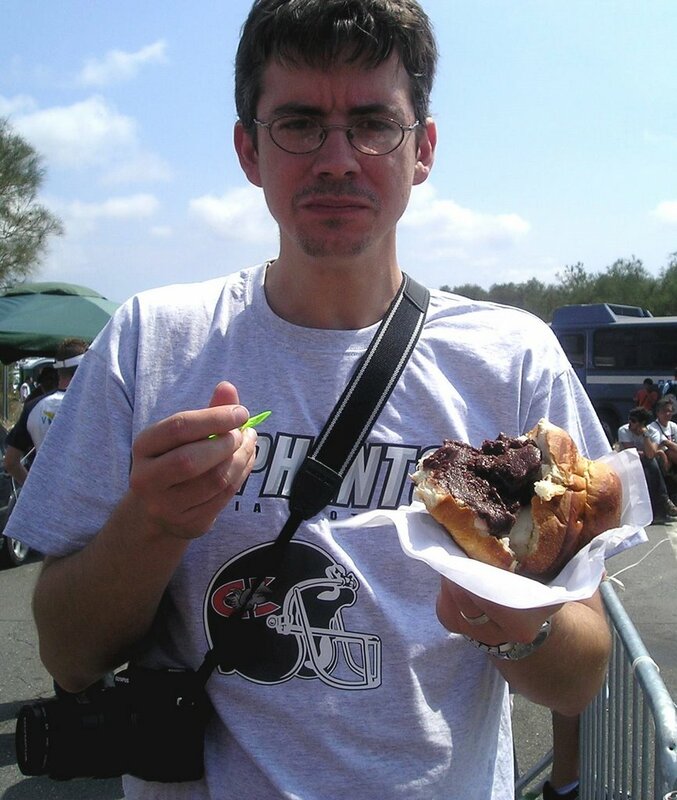 Here you see my friend Matt having chocolate and almond granite "in brioche." He would be smiling, but his mouth is full of granite at this moment. I liked the concept so much, I had one, too--strawberry and chocolate. Mmmm! Kids Say the Darndest Things (about Sicily) . . .
"Oranges were also introduced by the Arabs? I had no idea how much the Arabs influenced Sicilian foods and I am mainly shocked by the Oranges. They are like the main fruit of Sicily. You have your blood oranges, tangerines, regular oranges, mandarins, the list just never ends. You can't drive through one part of Sicily and say that you didn't see an orange grove, by that you can see a big Arabic influence. . . . Catania Market is my favorite place to go in all of Sicily, you can find anything you need there at a fraction of the price. Now that I read this article, I can actually see the connection between Catania Market and the Arabs. You know those little shops with the silver and beaded jewelry, hobo bags, and scarves? All those things are from the Middle East but people today still consider those things 'very Sicilian.' I guess that today, if we consider anything 'very Sicilian,' we should also keep in mind that we might actually mean 'very Arabic.'" "This article was very surprising and interesting to me. I did not even know that the Arabs were at any time in Sicily. Despite this, the Arabs had a huge impact on Sicily. . . . This article also talked about the mistreatment of the Arabs in Sicily. They were not treated with respect and were denied of building mosques. I also saw how they brought the markets to Sicily, living near Catania we have the chance to experience this influence by the Arabs. The markets also take place throughout the rest of Sicily." "Before reading this article, I had absolutely no idea that the Arab people had ruled Sicily, let alone for over two centuries. I also found it fascinating that present day Sicilians, people who we interact with everyday, are descendants of Arabs." "Already knowing that Arabic people were mainly Muslim I was very suprised to find out that the first Arabs in Sicily werent united until the Middle Ages and that it took Islam to unite them. All in all i realized that much of the credit we give to the Greeks should actually go to the Arabs. Now im not saying the Greeks didnt do anything because we've obviously got the evidence and the documents that prove otherwise. What i am saying though is that we kinda skip the part where Arabs ruled, and go straight into the great Roman Empire." "I always thought that Muslims just moved to Sicily because of what the island had to offer in way of education and 'all the pleasures of life on earth.' Living side by side, the Scicilians would have gained some knowledge and culture from the Arabs, especially as more moved to Sicily. But of course, all things in history are not that simple. I see now that the Muslims being strangers to the island would have had to take matters into their own hands before the former inhabitants rebelled against their living there." "Now I have a different perspective on culture here and how everything is not actually 'Sicilian' but sometimes is actually 'Arabic' in a way. It feels as if we don't give the Arabs as much credit as they deserve, which is disappointing to see." My friends Jan and Flint gave a great Mojito party this afternoon. I brought up the idea of making Mojitos soon after arriving back in Sicily two weeks ago. I had a couple of them on the flight (a Delta special!) after being introduced to them by my daughter Alison. 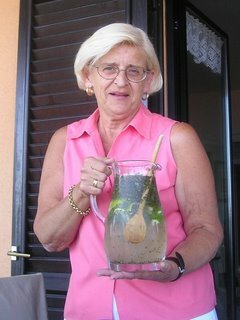 It just so happened that Jan and her friend Theresa were Mojito aficionados and experts! So, Jan volunteered to create a party around the Mojitos, which came to reality today as about ten of us gathered at her house for brunch and Mojitos. I had volunteered to locate fresh mint, which I did with no small amount of trouble via my local produce vendor and his wife (now friends of mine). They gave me some of their very own growing mint plants. Theresa (left), who is already enjoying her last year of teaching before retirement, played the role of "muddler" and also made the simple syrup needed for this drink. I think this might become her part-time job in retirement. The drink has Cuban origins, I learned, and is comprised of mint leaves, fresh lime, club soda, sugar or simple syrup, ice, and rum. It has to be made in a certain order and "muddled" (aka mashed together) at a certain point. This website gives you all the details. It seems this was another favorite of Hemingway (along with the Bellini and others). Jan and Flint have a beautiful view of the Med from their balcony in Aci Trezza, and today it was so clear that you could see mainland Italy! Anyway, I think this is the perfect way to spend a Sunday in September in Sicily. If you haven't tried a Mojito, I recommend it. You'll have to find your own perfect place and playmates, though.